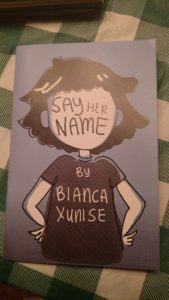 Yesterday we dove into Ben Passmore’s Your Black Friend, a book that I discovered at a panel at CAKE (Chicago Alternative Comics Expo), and today, I’d like to give props to another member of that panel: Bianca Xunise. If you did not read yesterday’s post, please do that now by clicking here; it will give you a bit more insight as I move forward. While visiting Bianca’s booth at CAKE, I picked up a small comic she had for sale entitled Say Her Name. This comic, much like Your Black Friend, is short, honest, and will open up some discussions when you share it with others. 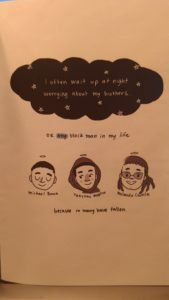 While Passmore’s book does in fact read as a field guide for white people, Xunise’s comic is about members of the black community living in fear of violence and mistreatment by the police. The book opens with the lines, “I often wait up at night worrying about my brothers. Or any black man in my life because so many have fallen.” And from there, Bianca tells a couple of personal stories: one about her father and one about two children that need help getting fare for a train ride. The connection to the person, as we discussed yesterday, is what makes it hard for the reader to feel anything but the type of honest reality that is also found in Passmore’s book. And while Xunise splashes a couple of jokes into her minimalist, cartoony drawing style, this book will not make you smile. And it shouldn’t. At times we need to shed light into the dark corners of the room, and we need to look at what is in those dark corners. Bianca helps us do that. These two mini-comics can easily be taught together, and if you contact the authors, I bet they’d cut you a good deal for the classroom. Bianca Xunise is from Chicago and Passmore is from New Orleans, so if you are in those areas, you might even have an opportunity to meet them and see if they’d be willing to speak with your students. And having heard them speak about these issues, I know that they can open up some minds.